There are two types of spins, the first referred to as an incipient or “partially developed” spin, and the second is referred to as a full-rotation spin. An incipient spin occurs when the wings become differentially stalled such that one wing becomes “more stalled” and the other wing becomes “less stalled.” In contrast, a full-rotation spin is essentially an uncorrected incipient spin, whereby the aircraft is allowed to continue in its autorotation. Autorotation is a stalled condition in which there is simultaneous movement around all three aircraft axes—that is, yaw, pitch, and roll; autorotation is also associated with a vertical flight path. Students must demonstrate that they can enter a spin, maintain appropriate control input until the command for recovery, or until recognition that the aircraft is no longer spinning, whichever comes first. Students must also demonstrate that they can accomplish prompt, appropriate, and positive recovery without excessive loss of altitude or exceeding airframe limitations. For Private Pilot Students, spin demonstration is accomplished with the Instructor; this demonstration includes the independent recovery by the student from two incipient spins—one with left rotation, and the other with right rotation—and two full spins—again, one with left rotation, and the other with right rotation. For Commercial Pilot Students, spin competence must be demonstrated on the flight test. You will be required to enter a spin and recover on the command of the Examiner, or recover immediately upon recognizing when the aircraft is no longer spinning and a spiral dive is developing. The command to recover shall be given when ½ to 1-turn of rotation has been completed. The aim of the exercise will be considered achieved whether a spin or spiral recovery is required. The Examiner may request that the manoeuvre be initiated from various flight conditions. All intentional spin recoveries shall be completed at the height recommended by the manufacturer, or no less than 2000’ AGL, whichever is greater. recover with minimum loss of altitude. avoid exceeding any airframe limitations. Note: Proper spin entry technique and full pro-spin control input that nonetheless results in the development of a spiral dive is acceptable, if the candidate announces “Spiral Dive” and uses the correct recovery for a spiral dive. You must make sure your passenger and all articles in the aircraft are secure, especially the fire extinguisher. A careful clearing turn is crucial; be sure to be smooth and to keep a level altitude during this clearing manoeuvre—you will score points. With respect to spin entry, use a prominent landmark for directional reference, and first begin the stall entry procedure by slowly closing the throttle—while doing so, use the rudder to eliminate yaw and maintain altitude with pitch inputs. 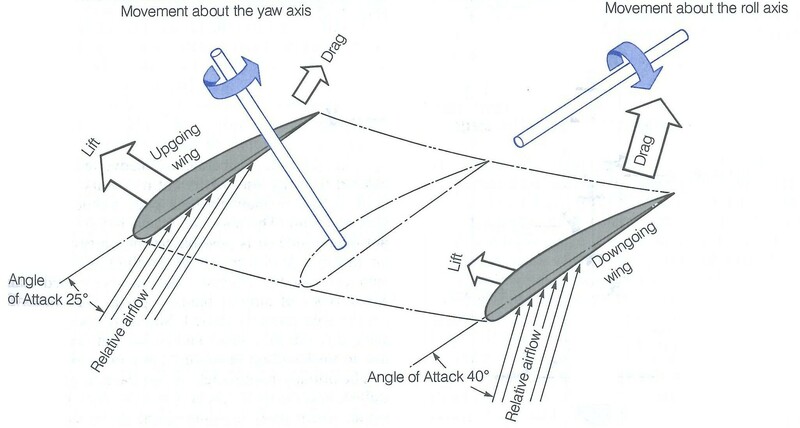 Just before the stall occurs, push smoothly but aggressively on the rudder pedal (full deflection) in the direction you wish to spin, and then pull smoothly but aggressively on the control column to a maximum nose-up attitude (full deflection).3 This is referred to as the “extension”—i.e., full rudder in the direction of the spin, and full nose-up inputs on the control column. The goal during this entry portion of the spin is to produce and hold this extension position. Throughout this, of course, you must keep the ailerons in the neutral position, and you must keep the throttle closed (sometimes students confuse spins with stalls and incorrectly attempt to open the throttle at this point). Students sometimes encounter difficulty in determining exactly when the full deflections (to induce spin autorotation) should be initiated. If the inputs are done too late, the control surfaces (rudder and stabilator) often lack the aerodynamic authority to begin autorotation. The aircraft simply “mushes” in a stalled condition, and the nose drops as the aircraft attempt to “self-recover” from the stall. Conversely, if the full deflections are entered too early, the aircraft performs an aggressive nose-up manoeuvre and, typically, the aircraft spirals off the top. Added to this are the variations that are associated with each aircraft, and the variations with the weight of the flight crew. To aid in your early spin practise, it is useful to make reference to the stall warning indicator—in the Piper Cherokees, this is the red light located on the upper left corner of the instrument panel. This light is designed to illuminate as a warning that a stall is approaching—between 5 and 10 MPH above stall speed.4 The first flicker of the stall warning light is a useful cue as to when to initiate the full-extension entry sequence—“kick,” “pull,” “hold.” After you gain experience with your Instructor, you will gain a sense of the aircraft’s “energy” during the spin entry, making you more effective at producing an effective outcome. There are many variations on the theme of spin entry and your Instructor will help you find one that works well for you. Spin recovery, like the spin entry, is simply a matter of “pushing the levers” in the right sequence. Contrary to popular belief, the recovery does not require advance pilot skill. For incipient and full spins, the recovery is basically identical with respect to pilot inputs. The only difference is that recovery from an incipient spin is initiated as soon as a wing begins to drop; in the full spin, the recovery inputs are made upon command by the Instructor or Examiner. With respect to pilot inputs, recovery requires smooth but aggressive rudder deflection—but now the rudder deflection is opposite to the direction of rotation. With the recovery rudder inputted, smoothly but continuously advance the control column forward —still holding neutral aileron, of course—until the rotation stops.5 In response to the opposite rudder and forward moving control column, autorotation during an incipient spin recovery will usually stop almost simultaneously with the inputs. In the case of recovery from a fully developed spin, the counter-spin inputs will cause the autorotation to first slow, and then stop. There is no special need or insight necessary to recognize the stopping—the world will simply stop spinning. For both incipient and fully developed spins, the stoppage of rotation (during the recovery) marks the point at which the pilot must immediately but smoothly neutralize the rudder and simply recover from the nose-down attitude—with the full-spin recovery, the nose-down attitude will be a rather dramatic, but the recovery from this remains straight forward and almost natural. Now smoothly but aggressively input back-pressure on the control column (i.e., pull) to recover from the descent—important, however that you maintain the wings parallel to the horizon—that is, you pull the nose of aircraft upward along a line that is perpendicular to the horizon (this will minimise wing loading).6 From the pull-up, you should target placing the aircraft accurately in the climb attitude to immediately begin recovery of the lost altitude. Power in the climb must not be added until the speed has returned to the normal climb speed range. In December of 1982, Piper Aircraft Corporation issued Service Bulletin (SB) No. 743, applicable to all Piper Cherokees certified for spins, and is therefore applicable to Langley Flying School’s Cherokee fleet. This document must be read by all students receiving spin training. The document provides expanded spin recovery procedures, and was introduced after a number of spin accidents. Essentially, it brought about the need to place a new placard in the cockpit—which now appears in the cockpits of all Cherokees approved by the manufacturer for spin manoeuvres. The procedures and recommendations contained in SB No. 743 are incorporated into the training you will receive. HASEL check. Altitude should be high enough to recover from an extended spin 2000’ above ground minimum, or prescribed by the Pilot Operating Handbook, whichever is higher. Security in the cockpit and a careful lookout are crucial for safety. During the lookout, keep your eye out for any aircraft within a five-mile radius—ask yourself where you will be when you complete the spin recovery. Is the fire extinguisher secured? How about your passenger and articles in the aircraft?7 If a person comes out of their harness during the spin and ends up on the control column, the consequences could be deadly. Partial application of entry and recovery procedures can cause prolonged autorotation, so simply concentrate on producing the correct control inputs in the correct sequence. Avoid excessive backpressure on the control column during the recovery pull-up and climb, as this can cause a secondary, high-speed stall. Be sure the wings are level during the pull out as failure to do this can cause excessive wing stressing and twisting. Solo spin practise for recreational and private pilot students is not permitted. 1 Two things are important to note here. Firstly, be aware of the terrain elevation above which you practise or demonstrate your spins. While a good pilot can conduct a spin in 700’ of vertical airspace, this is not predictable, and varies with the weight, loading, and simply the aircraft—as a rule of guidance, plan on your spin consuming 1000’ of vertical airspace (and you would not be criticized for planning on the need for 1500’). Secondly, always remember that the recovery rule applies to height above ground elevation, which of course varies. Take the time to note the variation in the elevation of the ground below the practise area 188(A)(T). To be safe, it is good practice to assume terrain elevation to be 500'. 2 A low ceiling is the reason why most flight tests are postponed. Here is the math: if the flight test is conducted in CYA 188(A)(T), a safe recovery altitude (owing to variation in terrain elevation) is 3500’ ASL; planning for 1000’ needed for recovery, the spin would have to be entered at 4500’ ASL; but 500’ vertical separation from cloud is required—therefore the cloud ceiling would have to be 5000’ ASL. 3 To assist students in getting this sequence correct in the aircraft, Instructors commonly recite the expression “Kick . . . Pull . . . Hold.” Abandon any idea here that you are trying to fly the aircraft in the sense of what you have heard thus far—you are not; instead you are simply pushing and pulling levers in the right sequence—the aircraft will do the rest. It cannot be over emphasised that aggressive but smooth handling of the aircraft is essential for successful spins. Of special note, you must concentrate on establishing and maintaining the “full extension”—full rudder deflection and full stabilator deflection (i.e., the stick back full). Cherokees do not like to spin and are designed to resist, and if you neglect to maintain the full deflection, the aircraft will unstall and develop into a spiral and the airspeed will immediately increase. 4 See P. 2-16 of the Pilot Operating Handbook. 5 The continuous forward movement of the control column is crucial to the recovery, and the reluctance or inability of a student to do this will easily result in exercise failure. Experienced pilots know that spins are practised in the utility category with the aircraft centre of gravity in the maximum forward position, but that in real life aircraft fly with a centre of gravity moved rearward as a result of passenger and cargo loading—in the “normal” category. In real-life, non-training flying, the aircraft may not recover from a fully developed spin and therefore the instantaneous and aggressive recovery inputs—including the control column pushed fully forward—at the early incipient phase of a spin is of critical importance if a tragedy is to be avoided. 6 While the pull-up must be quite aggressive as the aircraft is accelerating rather quickly, do not pull so hard that the “g” forces are physically uncomfortable. Also, get the pull-up started as early as possible as the airspeed is slowest immediately after autorotation has stopped and the “g” force will be minimal at this early phase in the pull-up manoeuvre. 7 See the comments on passenger security that appear in Footnote1.